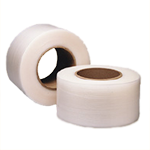 Quality Strapping manufactures a full line of plastic strapping for a broad range of industries and possible use. Our non-metallic plastic strapping is available for hand applications, semi automatic strapping machines, automatic arch strapping machines and fully automated strapping systems. No matter what your strapping application may be, from small parcel to palletizing, we have a strapping solution for you. Hand grade polypropylene strapping is mostly used for bundling and hand palletizing. The strapping can be sealed manually with strapping seals by the use of a strapping tensioner and sealer or pulled tight with a strapping buckle. Machine grade polypropylene strapping is used in wide range of industries. From meat and fish packing to high speed newspaper bundling. Strict product control during manufacturing ensures that the strapping will run smoothly in fully automatic and semi automatic strapping machines. Polyester strapping is the most rigid of all plastic strapping. It can be used in machine and hand applications. 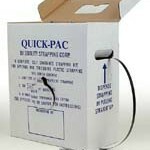 Polyester strapping can be sealed with strapping seals, heat or friction welds. They are the perfect alternative to steel strapping. Common use include heavy duty brick and lumber packaging, cans and bottle and also in the corrugated industry. Signode Equivalent strapping is a more economical alternative to Signode strapping and is guaranteed to work in Signode strapping equipment. Cord strapping is available in both polyester and rayon. They come in tow forms, Regular (uniline) and Woven (cross weave). Cord is used only in manual applications and is sealed using buckles, seals, or tied by hand. Polyester cord offers excellent resistance to moisture and is frequently used in outdoor applications. The heavy duty polyester sizes are now frequently replacing steel in lumber applications. Portable strapping kits are perfect for new strapping users or to easily carry around on job sites. Strapping kits are available with or without strapping tools.